Every Hindu festival has a back-story behind it. There are many back stories behind the festival of Raksha Bandhan. That was how her sari became endless and that saved her embarrassment when she was disrobed in public. This story gets mentioned more often. After the death of her husband Rana Sanga, Karnavati became the regent of Mewar and ruled in the name of her elder son Vikramjeet. But when Bahadur Shah of Gujarat attacked Mewar and defeated Virakmjeet, the queen reached out to her nobles for support. They agreed to take on Shah. At the same time, Karnavati also wrote a letter seeking help to Humayun, along with a Rakhi to seek protection. Humayun’s father had defeated Rana Sanga in the past when he led a confederation of Rajput armies against him in 1527. The problem was that the Mughal Emperor was in middle of another military campaign when the help came. However, they abandoned the campaign and decided to turn their attention towards Mewar. They were late though. The Rajput army was defeated by Bahadur Shah’s army, and Karnavati committed Jauhar – an act of self-immolation to protect herself from the indignity of falling in the hands of Bahadur Shah. But as soon as the Mughal empire came with their armies, Shah had to flee back. Vikranjit was then restored as the king of the kingdom. Another legend surrounds the festival of Raksha Bandhan. It’s the story behind Yama, the god of death, and Yamuna, the river that flows in India. One time, when Yamuna tied a rakhi to Yama, Yama was so moved that he granted her immortality. It is said that he declared that any sister who tied Rakhi on her brother would make the brother immortal. When Alexander the Great of Macedonia invaded India in 326 B.C., Roxana sent Porus (Roxana’s brother) a sacred thread and asked him to not harm her husband the battlefield. When Porus confronted Alexander during the battle and even had his sword on his neck, Porus let him go since he had promised his sister that he wouldn’t kill her. However, Porus lost the battle of Hydaspes River but gained Alexander’s respect and honor. When Alexander died, Porus was chosen to be the Macedonian satrap. Rather than via the Hindu scriptures, this tale has been made famous by the 1975 Bollywood film, Jai Santoshi Maa. One fine day, Lord Ganesha’s sister Manasa visits him to tie him a rakhi. Seeing this, his sons – Labha and Shuba – wanted a sister too. To give into their demands, Ganesha created Santoshi from the divine flames that are said to have been born from his consorts: Riddhi and Siddhi. When the demon King Bali asked Lord Vishnu to protect him, Vishnu, in a disguise of his doorman, kept protecting him to keep his words. But back in Vaikuntha, Vishnu’s consort Laxmi had been missing Vishnu. So she plans a trick. She disguises herself as a woman seeking shelter and reaches King Bali’s place. She asks him for shelter, and King Bali agrees to open the door of the palace. When Laxmi enters the palace, the palace is filled with wealth and prosperity. Laxmi then ties a thread of colored cotton on the wrists of Bali and wishes him for protection and happiness. Bali gets pleased with her actions and asks what she desires. 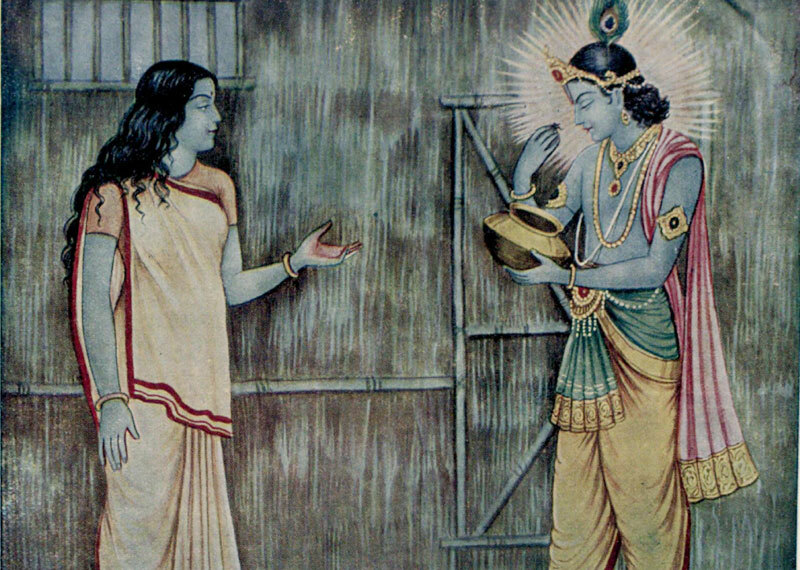 She points out to the gatekeeper, and King Bali grants her the wish so that she can have Vishnu back with her in Vaikuntha.